Jochs wrote: P370-30 is currently stopped near North Shore Drive in Benton Harbor. Sounds like the lead unit, IDTX 4601, had an oil leak in its air compressor and the oil leaked out, and they lost air pressure. Sounds like the train is going to be there for awhile, and they're working on buses to come get the passengers. 10:40 pm: Sounds like 2 buses are coming..be there in about an hour...so shortly before midnight. 10:42 pm: Sounds like P371-01 for tomorrow will most likely be anulled. I understand that new products typically have issues, but you'd think that the air compressors of all things would have at least been beta tested! Re: CSX Train Location Updates: April, 2018. Buses for P370 estimated to arrive in Benton Harbor around 12:45 am. Bus 1 goes to Grand Rapids, Bus 2 goes to Bangor and Holland. Look for Bus 2 on the Bangor railcam later! Amtrak one engine light power east at Vine at 05:59. 4 axles, 53 feet. AMTK 126. The good ole P42 to the rescue. Going to Riverside on track one, then tie onto rear of this stalled train on track 2 in Benton Harbor. Crew will tie train down, later crew will probably take train to Chicago. No 371 this morning. justin_gram wrote: No 371 this morning. Sounds like there will be. 8 am and they are doing the brake test. Just called the bridge operator to say they will move in 10 minutes. Presume they are meeting buses from the north. Q38528 westbound somewhere around Mulliken MI. Sounds like Q32601 is in Indiana as well. D70001 is headed west down Saugatuck hill - 8:12am. 8:50am - D700 west at bangor, single engine, 3 short covered hoppers, 2 boxcars, 2 tankcars, 3 loaded gondolas(scrap), 2 empty centerbeams, and 2 steel coil cars. 10am - back east at Bangor with CSXT 8181, with the reverse consist plus one hightop gondola from Hartford. Maybe with the Amtrak issues, they didn't take the 2 steel coil cars to Sawyer? First of all, it sounds like one of the buses is delayed until 8:40. Second, it sounds like they were getting ready to move and realized there were no MU cables to the good locomotive on the rear of the train. Oops! 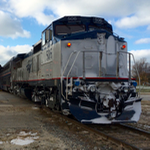 Edit: talking about the previously disabled P370-30, now P371-01 at Benton Harbor. Westbound approaching east end of Lake Odessa. Q385 by Breton Rd in GR 09:25. CSXT Q384, s.b. at Plymouth, MI @1123. Power is CSXT 489, 3472. Big cut of hoppers and a lot of tank cars. CSXT n.b. grain train tied down on south side of Plymouth. q32601 east at Bangor 11:19am, CSXT 3184 and CSXT 3465 for power. CSXT grain train still sitting at Plymouth. Power is CSXT 3103, 825, back to back. East facing train currently holding at the East end of South Lyon. Brake Pipe Pressure 60 psi. Last edited by J3rsdm5 on Tue May 01, 2018 2:39 pm, edited 1 time in total. SD80MAC wrote: Q385 by Breton Rd in GR 09:25. Q385 was by Howell at 05:25 with CSX 5271+820 and 79 cars. They stopped at Webberville to swap power with the grain train that was nearing time to be put together, still with two westward facing units that the train came in with. Q385 dropped off the 820 and picked up 219 to take into GRP with them. 820+5389 now back to back was picked up and headed east by 10:30 as G-010 but would turn into G764 at Plymouth. The grain train reported sitting on the south side of Plymouth since at least 06:00 this morning with CSX 3103+825 is V91926 bound for Grand Ledge when they find another crew. Q384 overnight with over 9000 feet of train and 154 cars once again sat at South Lyon, this time for four hours waiting for Q385 to get their work done so Q384 could do theirs. Thus, the reason V919 could never leave Plymouth to come to Grand Ledge. P370-01 is currently going through Riverside. Sounds like IDTX 4621 leading. Q327-01 is currently going through Benton Harbor. Q327-01 westbound at DD91.9 at 9:50 pm: 604 axles, 8464 ft.
MQT3001 wrote: I understand that new products typically have issues, but you'd think that the air compressors of all things would have at least been beta tested! Of all the defects I've ever heard of on the chargers, this is the first time I've heard of an air compressor issue of this nature. In other news, P370-01 just left Bangor a little bit ago with a charger, 3 supers and 90229 bringing up the snake eyes. Q327 is going into New Buffalo for a coal train that is still 40 minutes from Porter because the NS can't meet 2 trains on double track. N800-01 is currently going through St. Joseph. Sounds like BNSF 8594 leading. DD91.9 barely came in for me a few minutes ago...but sounded like the standard 532 axles for the train. Michigan Shore MMRR 2019, 2025 with 7 hoppers south at Riley St. Holland 9:30 AM.